On Wings of Eagles: Do You Welcome Visitors? Whitehorse, Yukon has a pair of unique skyscrapers made out of logs. 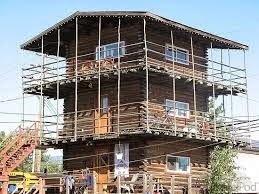 Basically, they are stacked log cabins! These three-story skyscrapers consist of 5 apartments and one store. They are 58 logs high, with each log weighing a minimum of 300 pounds. It makes for a quite unique heavy building! The original foundation in 1947 was in the ground; to support the weight however, concrete footings have been added in recent years. While the Alaskan Highway was under construction during World War II, the Northwest Staging Route airports and the Canol Pipeline were also being built. To say that housing was at a premium in Whitehorse would have been an understatement. Every hotel and home was overflowing with Air Force and Army personnel and construction crews. Even the riverboats were employed to accommodate the excess workers! And things didn't settle down after the war, either. Whitehorse then became the hub of the Yukon transportation system, and housing remained at a premium. Talk about a great time for real estate investments! Some of you may frown and wonder who would want to live in such accommodations; but if you could visit them today you will immediately see that they are loaded with character and charm. Add to this the fact that the apartments have now been insulated, dry-walled and equipped with plumbing, electricity and the latest technologies, and you have one very desirable dwelling! The purpose for housing has changed dramatically over the centuries. Imagine for example, living in Jerusalem in first century A.D. Unless you were rich, you house was used solely as a place to sleep and store provisions. You lived in the courtyard, and that's where you invited the neighbors to come and share in your meals and conversations. Even as late as the early twentieth century, housing was still people friendly. Doors were left unlocked and neighbors were welcome, even if you were away! But things have changed however. Houses are now used to keep people . . . OUT! Ah those noisy bothering neighbors! Our houses have turned into mansions of doom. "It's my house, not yours! Get out!" As Christians , we are urged to be different: "Love one another. As I have loved you, so you must love one another. By this all men will know that you are my disciples, if you love one another." (John 13:34-35 NIV) But how can we truly love one another with a closed door policy? Do we always welcome visitors into our home with open arms? Or is our attitude something like this? "What do you want? Money again! What do you take me for?" Or "Jehovah witnesses again! " Or "Who gave you the permission to tell me who to vote for? Go back where you came from!" Sometimes our attitudes do improve: "What! I just won the lottery and you have a check for me? Come on in! You are more than welcome in my home!" Wealth is not measured by what we have but by who we know, and it is demonstrated by how well we respond to others. Who's at your door, now? Will you welcome them with open arms or with clenched fists? Dear Lord, help us welcome those You bring to us with open arms. We thank You for what You have given to us and pray that we would be willing to share that wit those around us who need help. In Jesus’ Name, Amen. Do You Love Your Enemies? Do You Show Love by Respecting Others? Are You Melting the Ice? Does Your Faith Move Mountains? Are You Doing What Jesus Ask You to Do. Will You Find an Excuse To Love? Do People See Christ In You? Will You Be Motivated By God's Love?